As some 3,000 Hondurans made their way through Guatemala, attention turned to Mexico, after U.S. President Donald Trump threatened Thursday to close the U.S.-Mexico border if authorities there fail to stop them -- a nearly unthinkable move that would disrupt hundreds of thousands of legal freight, vehicle and pedestrian crossings each day. 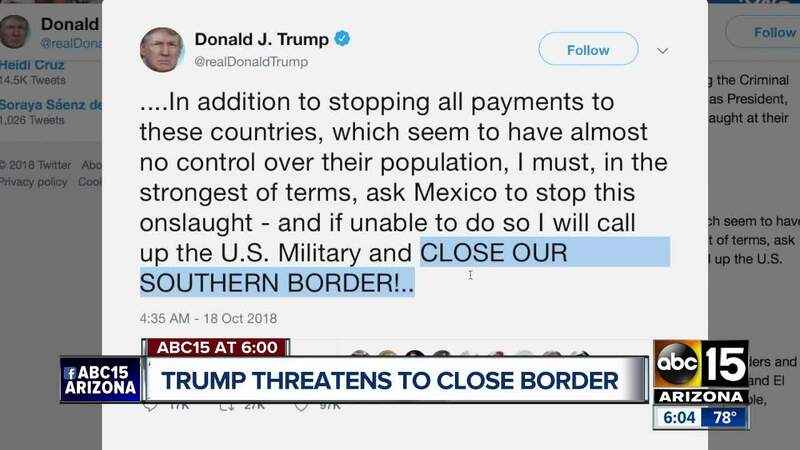 "I must, in the strongest of terms, ask Mexico to stop this onslaught -- and if unable to do so I will call up the U.S. Military and CLOSE OUR SOUTHERN BORDER!" Trump tweeted, adding that he blamed Democrats for what he called "weak laws!" On Thursday, Mexico's foreign ministry said the government was assisting members of the caravan who had already crossed into Mexican territory. It was explaining the options open to the migrants and helping those who chose to apply for refugee status to navigate the lengthy process. Mexican federal police and immigration officials also appeared to detain immigration activist Irineo Mujica, who led a caravan of migrants through Mexico last spring. Mexican officials had said the Hondurans would not be allowed to enter as a group and would either have to show a passport and visa -- something few have -- or apply individually for refugee status, a process that can mean waiting for up to 90 days for approval. They also said migrants caught without papers would be deported. Still, the idea that Mexico could close its porous southern border -- or that the United States would choke off the lucrative trade and other traffic between the two nations -- strained the imagination. U.S.-bound migrant caravans have been going on for years -- with traveling in numbers seen as offering protection from assaults, robberies, even shakedowns by police. They're also a cheaper alternative to the $7,000 to $10,000 that smugglers, charge for passage to the border, Leutert noted.